Many plants are known for their ability to track the position of the sun in the sky by a process called solar tracking or heliotropism. Some plant species like the sunflower plant orient their leaves so they will be perpendicular to the sun's rays throughout the day to maximize photosynthesis, as the movie below shows. The flowers of some plants also display solar tracking behavior. However, floral movements are not necessarily exhibited by the same plants that display leaf solar tracking. In addition, an innate circadian clock may contribute to activation of the tracking movements. Circadian movements may continue even if the light cycle is interrupted. Often the movements may initiate prior to dawn in apparent anticipation of sunrise as seen in this movie where the plant moved its leaves towards the east prior to sunrise, indicating circadian clock control. For this movie, images were captured every 4 min for 24 hours starting at 6:23 am. The night period has a yellowish cast due to illumination from a tungsten porch lamp. The camera was facing north. Many people are under the misconception that the flower heads of the cultivated sunflower (Helianthus annuus) track the sun. Certainly, when you see a field of cultivated sunflowers, the flower heads face in more-or-less the same direction. 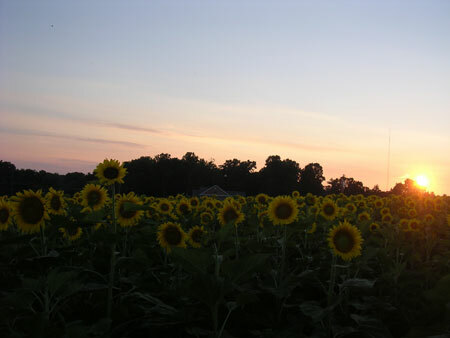 However, if you view a field of sunflowers in the afternoon, it will be apparent that the flower heads are mostly facing east, where the sun rises each morning. The image here shows that as the sun was setting in the west, the flowers are facing east as they do all day one the flower heads are open. Immature flower buds of the sunflower do exhibit solar tracking and on sunny days the buds will track the sun across the sky from east to west and by dawn the buds will have returned to face eastward, like the leaves in the movie above. However, as the flower bud matures and blossoms, the stem stiffens and the flower becomes fixed facing the eastward direction. Flowers of the wild sunflowers seen on roadsides do not follow the sun and their flowering heads face many directions when mature. However, their leaves exhibit some solar tracking. Unlike the sunflower flower, the flowers of some plant species track the sun across the sky from east to west. A good example of this is the alpine plant, the snow buttercup (Ranunculus adoneus). By facing the sun, the flowers of the snow buttercup are able to collect heat from the sun. The heat is thought to help pollination since the insect pollinators will warm and be able to fly better in the cold air and deliver pollen more effectively to other plants. The warmth also appears to help the pollen germinate after it is delivered to another flower.